Kitchener, early 1985. A 12 year old little Mike is at Stanley Park Mall with friends Bob and George, and a little bit of allowance money. There was a crappy little rock shop in the mall that sold T-shirts, posters and buttons. It was on a corner of one of the corridors, right down the hall where I would later work at the Record Store myself. For a little while back then, my favourite band was W.A.S.P. They were soon usurped by Iron Maiden and ultimately Kiss. At the time of this particular visit, it was still W.A.S.P., and my favourite W.A.S.P. was Chris Holmes. I had enough money for one rock button – my first. The one of Chris caught my eye. He looked cool and theatening in the picture holding his blood-streaked guitar. Bob approved. “If you get that one,” he reasoned, “you’d be the only guy in Kitchener to have that button on his jacket.” I don’t know how he knew so precisely that I would be the only person in Kitchener to have it, but it made sense. The shelves were full of other bands: Motley Crue, Van Halen, Motorhead, Iron Maiden, Judas Priest, Rush, and Black Sabbath. 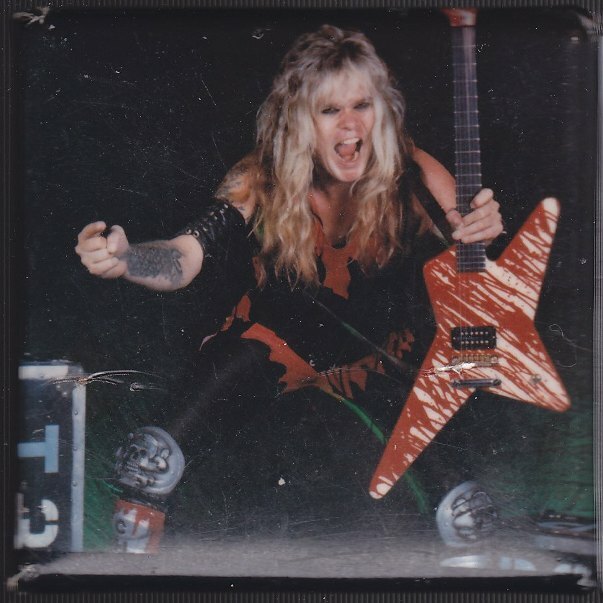 You didn’t see as many W.A.S.P., and you didn’t see any with just Chris Holmes. “I’ll take this one,” I shyly said as I made my purchase, but I was happy. Which button would be next? Over the months, I added more to my collection. Two more W.A.S.P. buttons, an Iron Maiden, and a Kick Axe Vices were next. 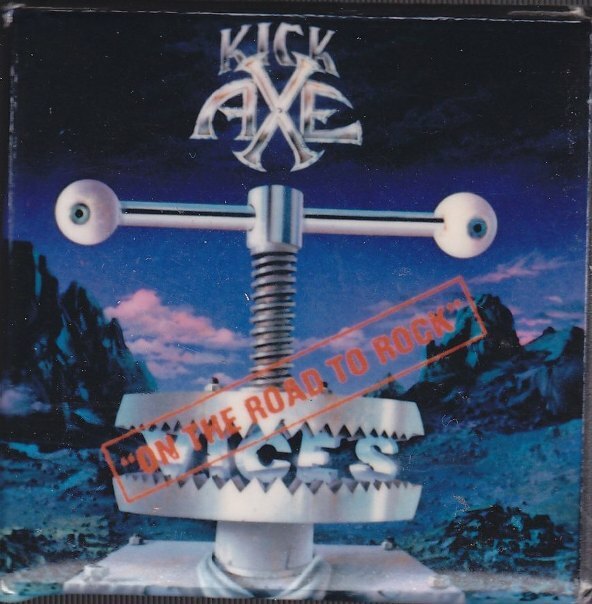 The funny thing about that one is, of all the buttons here, the only band I don’t own an album from is Kick Axe. I love their song “On the Road to Rock” but to this day, I still do not own Vices! I still don’t have any Kick Axe! Bob and I focused on Iron Maiden from there in, although I seem to remember also having a Judas Priest button that is now lost. We would trade them until we had all the Eddies we could find. Eddies were the best, much better than buttons with just the band on them. We were specifically looking for the Eddies. The most common seemed to be the mummy Powerslave Eddie. They were everywhere. The best one, to us, was the “Aces High” Eddie. We each had one. Once in highschool, Bob did something I wish he didn’t. He ripped all the pins out of the back of his buttons, so that he could better tape them up in his locker for display. Every last one, wrecked. Bob had a habit of modifying things, only to destroy them. He hacked a piece of out his guitar to make it look more jagged, but it weakened the tone. The paint job he gave it wasn’t much better! He also wrecked his amplifier by sewing a huge Iron Maiden Powerslave patch onto the front. I on the other hand am glad I hung onto this stuff and kept them intact. They bring back so many memories. I can remember that conversation about the Chris Holmes button at that store. I remember being with those guys at that exact spot and buying that button for those reasons. I think that location might be vacant now. I don’t know because I haven’t been to Stanley Park Mall in a long time. The place has almost completely died, except for a bank and a grocery store. When we kept items like these buttons as kids, I probably said something ridiculous like “One day this will be worth something, so I’d better keep it.” What I didn’t appreciate is that these buttons are worth something now. They trigger memories, and that is something money can’t buy. The rest of these buttons came much later and there’s not much to say about them. The I Mother Earth Blue Green Orange and Yoda buttons were both store promos. The Samuel Jackson Snakes on a Plane button was made by me, at a summer barbecue for Jen’s old work in Brampton. That movie had just come out and I had an Entertainment Weekly magazine in the car. We entertained some of the younger kids by giving them good pictures to make buttons with on their button maker, and I made Samuel for myself! There were two Jamaican ladies there who loved it. Those two really liked Samuel, if you know what I mean! The Walter Sobchek (John Goodman) and “Geddy” buttons were made for me by friends. The rest were gifts. The Helix Power of Rock and Roll button was given to me by Brian Vollmer himself at the Power of Rock and Roll CD release party! The cool thing about it is that it is dated specifically to that gig, August 19 2007. Oh man what a flashback! I remember all of those buttons! And patches! People used to cover their jean jackets with them! You know something, I might still have one or two of those pins in a bin somewhere, myself. They wouldn’t be anything metal, but I remember owning some. If I can find them, I’ll send you pics. This was a really great post, huge nostalgia and a topic that I’d forgotten about completely until you brought it up! Thanks buddy! I’m really glad I kept stuff. Bob didn’t have the same attachment to material things that I did. If he got tired of it and could sell it or do something else with it, he did. He never understood my keeping of things. But dude, I have pages and pages and pages and pages…I’d say hundreds…of drawings that he and I did. And I’m damn glad I kept them. Keeping things helps me remember things, you know? And these are good memories. I have a lot of artwork (even an adorned pencil case) that my buddy Brian and I did in high school. I was thinking of sending it all to him, just for a laugh! I had a GN’R patch that I bought just after picking up Use Your Illusion II. Never done anything with it, though. I do have loads of badges. Still. Only have a few pinned on my jacket now (mostly cause they got ruined in the rain). I need more badges!! I could do a whole post about my denim jacket. It’s just incredible. I have a pic of it here somewhere. Here’s my jacket, J! And you can only see the front of it, it had patches all down the sleeves too. I have that jacket in my house. Skip ahead to 9 minutes into the video, that is when you will see the EPIC DENIM JACKET! I can’t find my jacket dude! I must have packed it in a box shortly after that video was made. Oooo and also, nice Stones reference in the post title. Attaboy! Thanks buddy, that was for you! Apparently Encore Records downtown has Vices, remastered. GO BUY IT!! Oh so good. Mine is an RM and it sounds great. LET US SEE YOUR BUTTONS! Lego Maniac!! OMG – stuff all the others! I loved this post Mike, I too used to collect them all as a teen, I had a fine collection of AC/DC ones. I kept a few choice ones but I really wish I’d kept them all now. Great post. Do you want the Lego Maniac button? AC/DC also had awesome buttons. I remember seeing Who Made Who around a lot on buttons. 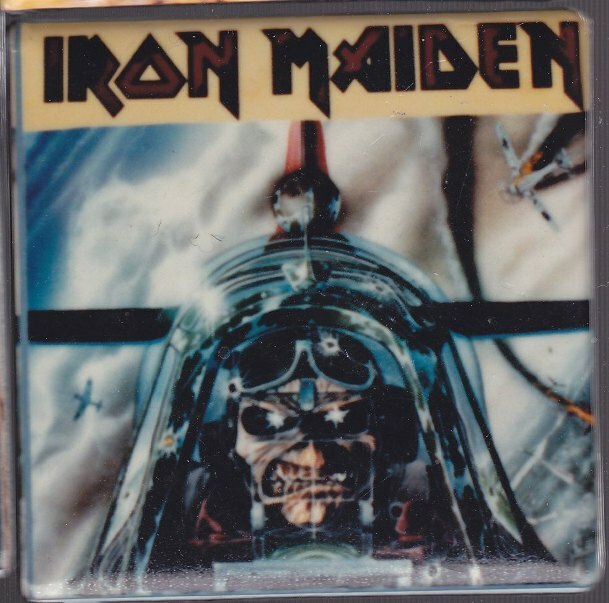 They had such great album covers…Fly on the Wall and Flick of the Switch were two other buttons I remember seeing. Sorry Mike I missed this one, didn’t mean to be rude. That’s so kind, but you keep it I wouldn’t wear it and it’s part of your past. I had a big 2-pin die cast badge of the AC/DC logo on my denim jacket. Christ knows what happened to it. Wow that would be something to dig up! I never had any TWO pin badges! I’ll have a look when I go home next month. The homemade Samuel L. is a standout! It felt like one that could be safely skipped! Cool about the WASP button. I bought a Mercyful Fate button for the same reason. Right on. I love that. Ya know, I remember a long-standing shop on Queen W in Taranna that sold all sorts of buttons and patches and belt buckles (and likely bongs, natch). I wonder if that’s still there. Probably.